Much to my delight, I found Britt-Marie was Here in paperback over the past weekend at the bookstore. I've been wanting to read this book for quite a while. Backman's writing style reminds me of Roald Dahl for adults. Also I started Small Victories by Anne Lamott, she is such a fantastic writer and observer of life. She's a treat to read! Today I'll be doing afterthought heels on my socks in a pretty lilac that doesn't match but definitely "goes" with the socks. I continue to make progress on my shawl and sweater, but no photos today. I never thought about a Backman/Dahl similarity but I think you are right! They are both funny, sad, poignant, and unique. Looking forward to seeing those completed purple socks! Excellent book choices! Anne Lamont has a new book coming out this spring too. I enjoy viewing/reading about your current projects/books, etc. Two favorite authors and your socks are so pretty. The lavender heels sound perfect! The socks look great, I love the yarn! The socks are lovely! 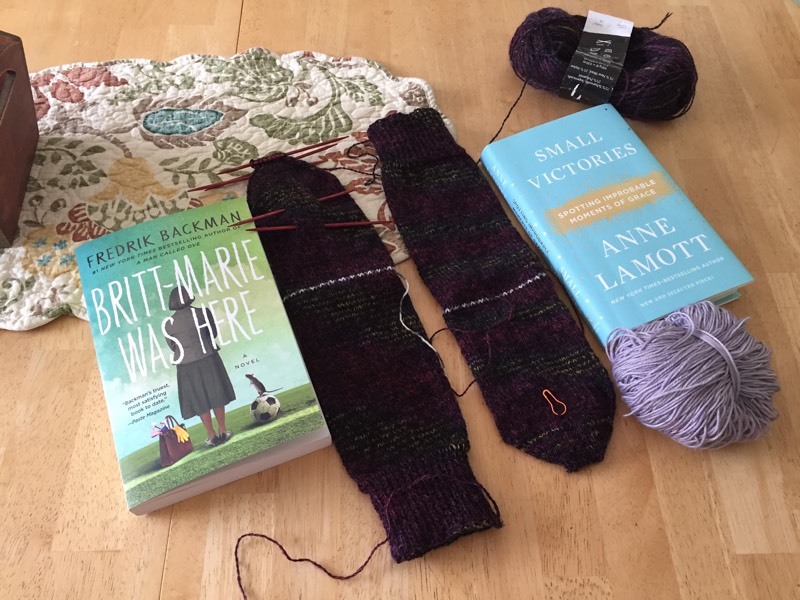 I would love to knit myself some someday, but the only way I seem to avoid second sock syndrome is to knit baby socks :-) I haven't read any of Anne Lamott's books either, but this one looks really good! Putting Backman on my to check list! Wonderful color for socks! The lilac will look wonderful on that stunning shade of purple. Both books are in my TBR--I should move them closer to the top. :) Socks vex me, I just can't get into them. Lilac heels will be lovely! And, I just got Backman's latest book from the library! What a pretty purple! I've read Brit Marie, I hope you will post your thoughts on this book. That touch of lilac will be fun. You will be kicking up your heels. We read Small Victories in our book club last year and had a good discussion. Enjoy. That will be neat...to throw a different shade of purple in those socks. I will have to try Backman's work. I don't think I've done so yet. The socks look absolutely lovely and oh-so cozy! love those socks....and two of my favorite authors....the daily double! I love both of those authors! I just got My Grandmother Asked Me to Tell You She's Sorry, so now I have to look for yours.Have you read Traveling Mercies by Lamott? Your socks are great; I've never tried an afterward heel. Is it difficult?